LiFe are great but different than batteries containing lead and acid (be it wet lead-acid, GEL or AGM). These are all the same technology, while Lithium-Ferrite (LeFe are completely different and behave differently. One has to get used to LiFe and you have to do some amendments in the charging process and they are experienced totally differently. The good news is that if you have a decent charger which allows to change the settings, you can do the re-programming of the charger yourself and do not need to buy a new charger. The new LiFe batteries in Regina Laska. Each of the four 160Ah Super-B batteries have their own built-in computer. In addition to these, there is an external control box (top) which controls each battery to work perfectly together. All this is new for 2018. I have lived with traditional batteries for decades and learnt to “read” these, by comparing voltage with the amount of Amps currently floating into the batteries and thereby getting a picture of their State of Charge (SOC), which often is indicated as a percentage in the Ah-meters. I could also quite easily understand when they were getting full (charging going down in Amps while Voltage had reached its set bulk voltage level). With LiFe it is all quite differently. My control unit where I can read voltages, amps, power consumption, amount of charging, battery temperature etc and, at the same time, re-programme my Whisperpower charger/inverter Combi. The good thing with Whisperpower is that it lets me change and read every available setting. 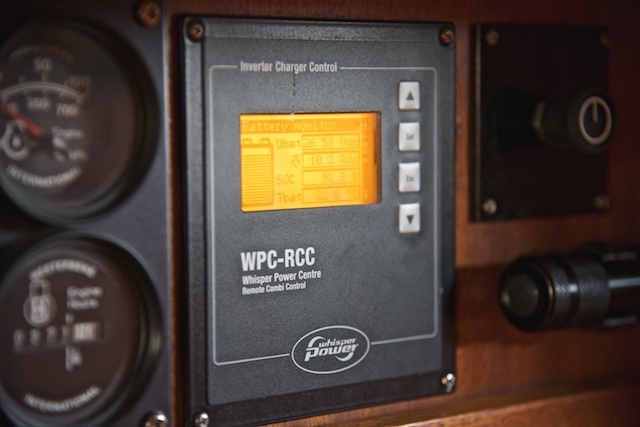 It’s a bit risky, if you don’t know what you are doing (hence, you can lock some settings for the novice) but it is great to optimise your system to your boat and batteries. First of all, please note that I chose LiFe from a very renown company (Whisperpower in my case) rather than LiIon batteries found in electric cars, computers, smartphones etc. LiFe don’t have as good energy tightness than LiIon, but are much safer when it comes to fire etc and also much more resistant against frequent re-starts of the actual charging process (many engine starts for instance). One can also buy much less expensive Li-batteries and build an own system. This saves money but I am not a friend of this. I opted for the more expensive solution with a renown battery company building the system for me with a built-in computer in each and every battery plus an external electronic control box controlling my four batteries. This is, in my view, much safer. There are enough items to programme (see below)! The voltage is not only generally higher in LiFe than traditional batteries (13.2V), but the voltage also remains equally high from almost empty battery to totally full charged. Especially confusing, the charging current in Amps remain at full until the bitter end (SOC = 100%) and then: that was it! The current immediately goes from fully charge (in my case 90A) to float charge (i.e. close to 0A). With traditional batteries, you could much more easily tell “soon they are getting full, I could now stop charging” when the batteries reached close to SOC = 80%. Since traditional batteries slowly drop in Amps, you seldom could charge more than up to 80% (other than with shore power). And since you shouldn’t discharge to more than 50% all you got was more or less 30% of the full capacity with traditional batteries (wet Lead-Acid, GEL or AGM – they are all very similar). For this reason, with LiFe, the SOC-reader (in percentage) becomes important. This is the only way you can see how full the batteries actually are, so forget using a voltage meter to check how full the batteries are. It is all similar to your iPhone, which also used Lithium. With most Ah-meters, giving the SOC in percantage, this becomes a bit of a problem, since they are not perfect. The reason is that external Ah meters (like you use with traditional batteries) are external devices outside the actual batteries. You don’t collect that data from inside the battery themselves but from an external Ah-meeter. Your Ah-meter you might already have onboard gives a “dead reckoning” of what it believes has been taken out of the batteries and how much it fills. It’s like a guard standing outside a building counting the number of people entering and leaving. But he might miss one or two or, especially after some time, loosing track of the mass, if too many leave or go or escape through windows or cheat themselves past the guard. My LiFe batteries have a computer built into the actual batteries and a special external box controlling my four LiFe batteries so they all get equal amount etc. My LiFe thus have an internal computer knowing their State of Charge (SOC). But, in my case so far, the batteries do not communicate their information outside the batteries and I do not have a display showing what’s going on inside the batteries (yet). So, for the next winter, I will install a CAN-Bus – USB translator and a new touch screen so I can display all the date from inside the batteries. This way, I will have full control of what’s going on inside the batteries! Batteries about this will come next spring 2019 and will be added here. Other than that, I did not have to change the equipment, since I could reprogram them to suit for the LiFe batteries. After some testing and communications with Whisperpower, I found the following settings are working the best, except for the said SOC, where the percentage still is not giving the perfectly correct figure and only an estimation For a 12V boat, just divide all voltage settings below by 2. Charge current (WhisperPower setting 1138): 0.5 x Capacity, in my case I maximised the current to 90A which is about what my Combi will give. Current at end of absorption (WhisperPower setting 1159): 10% of capacity. In my case 32A. If your charger has the possibilities to change the above settings manually, as in the case of Whisperpower, you can control the charger freely and set your parameters for LiFe. Or even better: exactly for your boat and the batteries you have. Alternatively, your charger as a quick-set-button called “Litium” and it should work roughly. The 24V 110A High Output Alternator on the separate bracket (white to the left) and the Volvo standard 12V alternator for the starting battery and emergency battery (both 12V AGM) to the right (silver). The external Whisperpower regulator for the High Output Alternator. On the three screws (white) you can adjust the voltage for absorption, the time of absorption and the voltage for float. For the 110A/24V High Output Alternator on the main engine, the existing three stage regulator is adjusted according to the battery levels, i.e. What do I like most with the LiFe batteries? First of all I hope for a long life. 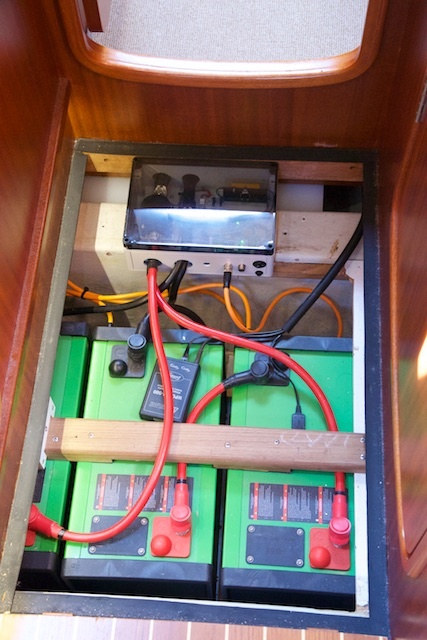 My AGM batteries (and they weren’t cheap either) lasted some 5 years (6 months sailing per year). They still worked, but I could feel a significant drop in capacity. Secondly, I like the fact that they charge so many amps until full so I can really use the entire capacity. However, as always with batteries: You have to put in, what you have taken out. 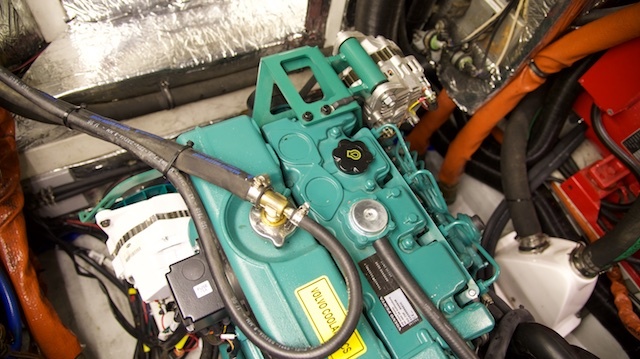 It’s just a question of running your generator or main engine for shorter periods. If you, however, are charging constantly by means of solar panels or wind generator, then the batteries don’t matter so much, because you are just using them as a buffer between the sunny and/or days. Of course, you need much less capacity with LiFe (since you use close to 100% of the capacity rather than typically no more than 30% of the capacity of traditional batteries, see above). So you need less Ah in the batteries, which saves some of the heavy costs. Further they weigh much less and take up less space. In other words, the total usable power remains the same in theory and increases by over 50% in practice, while recharging is done during considerably less time, saving hours on the engine/generator. The saving in weight is 185 kg. Self-Discharging is considerably less, and does not harm to the batteries. 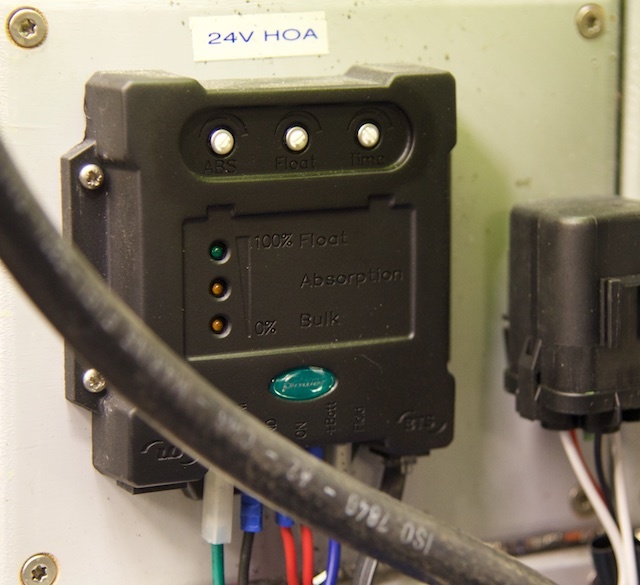 Any state of charging is acceptable over time so they do not have to be re-charged immediately to avoid sulfatation as with AGM/GEL/Lead-Acid. On the down side there ist cost for this investment. My batteries were more expensive than my new diesel engine….! :-( The SuperB LiFe batteries cost well over EUR 3000 per 160Ah battery and I have four of these. Plus the external computer which controls my four batteries. And for next year I will install an extra touch screen display to read what’s ging on inside the batteries. The good news is that the installation costs were close to zero, since I just had to replace them and then re-programme the charger as per the above. Would I do it again? Cost aside: Definitely! They give a huge freedom! And if the life-span of LiFe are as long as advertised, cost per year might even be similar as with AGM or Gel. But if you don’t mind watering batteries and keeping them under control and exchanging them regularly, since they don’t last as long, wet Golf-Cart batteries, such as the Trojan 105 are the most cost effective, I believe. But I don’t like the idea to exchange and throw away batteries regularly, for environmental reasons. I hope for the fact that I will be able to keep these LiFe batteries for a very long time!